En route between visits to family in Vermont and rural Ontario, I spent a day in Toronto last week. Toronto is Canada’s most diverse city, and alongside New York, perhaps the most diverse in North America. While in Toronto, I had the good fortune to meet and chat with Tonya Surman, executive director of Canada’s most dynamic shared workspace for social entrepreneurs, the Centre for Social Innovation (CSI). I’ve been a fan of Tonya and CSI for a couple of years. Impressed with her approach to multi-organizational collaboration, and the potential of a CSI in my own town, Tonya and CSI seem to hit the heart of what many are looking for, shared spaces to work alongside and/or together with, kindred spirits, for the public good. Why is CSI taking off? Diversity is a key. CSI was conceptualized, and continues to evolve, with diversity as a catalyst to creative change. Diversity in ways to work, meet, and connect with community, in tenant membership, in investment funding, and diversity in who is being served through social innvoation. Diversity is part of a living systems approach to deal with complex social challenges. As you see in the video, it is a space designed for diversity; for ways to meet & connect. It is a welcoming workspace in so many ways, especially for Newcomers to Canada. And while on workspaces, how about great public spaces that work! 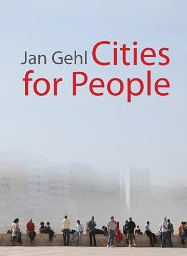 I learned much on this front in Jan Gehl’s terrific book, Cities for People, a book that is wonderfully crafted, a joy to read and visualize (great pictures, images), and highlights the power of diversity. And on a more personal level, diversity in relationships may be your best strategy to career success, as mentioned in this month’s Harvard Business Review article. Hmmm. What do you consider a great workspace, designed with diversity in mind? Thanks Soren. And, I’d be interested to see/read/share your account of that conference. Keep me posted. Awesome post ! Nice information regarding co-working spaces. A coworking space is a shared space that anyone can use for any kind of quiet work they like. The more you head out to these co-working spaces, the more people you can meet and spread out your name in the industry for potential employers in the future. Thanks for checking in… and good to know (after looking at your website) someone else providing collaborative workspace options near Toronto.